Set in Tripoli in 1960, Hadachinou is a young, lonely boy who is surrounded by the women in his life. In the sweltering heat he sneaks through the sun-drenched streets, listening in on the whispered stories of the women in his life. He becomes an invisible witness to their repressed desires and solely becomes aware of his own. 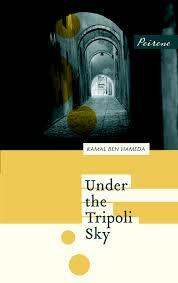 Under the Tripoli Sky is a very short book at 104 pages and it’s a very meandering kind of story. It’s made up of little snap shots of Hadachinou’s life and the interactions with the different women in his life. There’s his mother and her friends, his aunts and cousins, and a young girl that helps out around his house. He has a lot of freedom and because he’s a child, he often goes unnoticed by his mother when she has her female friends in the house. As he’s unseen he can watch and listen from the side lines, and through his voyeurism he begins to be aware of women’s desires and his own. Though that doesn’t mean he understands them. The writing in Under the Tripoli Sky is poetic and immersive. The heat, the sand and the sea are easy to imagine as Hadachinou explores his city. There’s almost a dreamlike quality to Under the Tripoli Sky as Hadachinou has so much freedom and a seemingly idyllic childhood. But it’s a dream that we, as the reader, know must come to an end as it’s set before Gaddafi came to power and so the society in Tripoli in this story is quite different to what one might think of Tripoli and Libya today. Under the Tripoli Sky is a coming of age tale about an inquisitive child. Hadachinou may be privy to more than the adults in his life are aware but that doesn’t mean he understands it all. There’s some interesting insights into Libyan society in the early 1960s, the troubles and traumas that face women but also how things do seem to be evolving, but overall it’s a book that’s composed of vignettes that don’t leave a lasting impression.